US, 1963, 110 minutes, Black and white. George Hamilton, Jason Robards Jnr, Jack Klugman, Sam Levene, George Segal, Ruth Ford, Eli Wallach. Act One was written and directed by prominent M.G.M producer of the '50s Dore Schary. He wrote such films as Sunrise at Campobello as well as the stage version of such works as Morris west's The Devil's Advocate. 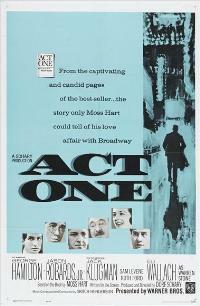 This is a semi-fictional presentation of the biography of Moss Hart, the prominent playwright e.g. Lady In The Dark. George Hamilton at the beginning of his career is effective as Moss Hart. Jason Robards is very good as the eccentric playwright George Kaufman. The film reflects the atmosphere of playwriting in New York in the '30s and '40s and has the flavour of the American stage. It might be compared to such biographies as Gaily, Gaily, the period comedy biography of the early years of playwright Ben Hecht. Of interest as background to the New York and American theatre of the early 20th century. 1. Was this an interesting and enjoyable film? Why? Why did it have such a personal interest? The character of Moss Hart and his world? 2. How did the film present ambitions and the need for success? And the suffering entailed by someone who is ambitious? Was this portrayed convincingly? 3. Moss Hart as a person: how interesting as a person? The impact of the initial sequence with him ? home and the leisurely start of the film? The failure of his play? The world of his friends? His work, especially with the theatre group? A serious young man with ambitions? 4. What were Moss's friends like? Joe and his sincerity and his willingness to help Moss? Why? Lester and his pessimism? (Was this merely a pose? What kind of person was Lester?) David and his admiration for Moss? Why? Archie Leach (Cary Grant) and his popularity and seeming success? 5. What was the drive in Moss Hart that made him continue to write, despite failures? Why was he too serious? Why did comedy repel him at first? Why did he write the comedy? 6. The sequence with Warren Stone. How much truth was said by Warren Stone? What kind of a person however was he? His keeping Hart waiting? His theatrical attitudes. His final callousness? What impression of theatre producers did this give? Is this a just impression? 7. The importance of Lester's intervention? Should Lester have intervened? Why did Lester intervene? 8. The personality of George Kaufman: what kind of a person was he? How fidgety and mannered? Was he likable? Was he genuine? Was that his true self? How did he relate to Moss Hart? Why? 9. How interesting were the sequences of their collaboration in the work? How did their personalities contrast? Complement each other? The naive Moss trying to thank Kaufman? Kaufman's offhandedness and oblivious work? 10. Were you surprised that so much work was needed for a play? Why is such work needed? Did the film give insight into how a play is constructed? 11. What was the effect on Moss of all this? Why was he attracted to a glamorous world? Did this mean any less sincerity on his part? 12. The impact of the tryout failures? Why did the play fall? what effect did it have on each of them? Why? 13. Why did the failure goad Moss Hart into success? Was this a growth in character for him? Why did he dare to force Kaufman to continue the play? 14. What insight into human personalities, work, theatre did the film give?